As I mentioned last week we are in the middle of remodeling both the bathrooms in our house. At the end of last week, we had no working bathroom for two days plus it was our fifth wedding anniversary, so it seemed like a good time to get out of town. 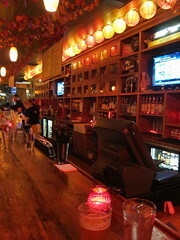 We packed up the car and headed to Madison, Wisconsin for a beautiful fall weekend of tasty restaurants and microbrews. 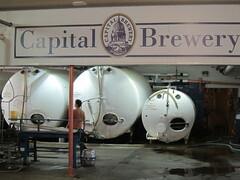 Our first stop was Capitol Brewery just outside of Madison in Middleton, WI. Capitol offers a short tour with three tastings and a tasting glass you get to keep for $5. Capitol is enjoying its 25th Anniversary this year so along with all their other beers we go to try the special 25th Anniversary brew, Eternal Flame, a blend of their limited Autumnal Fall and an Imperial Dopplebock. My favorite of their beers though had to be the Autumnal Fire, a rich doppelbock. Capitol has some beautiful tasting rooms inside that were being used for private parties, but we were happy to spend the afternoon in their large beer garden with a lot of other neighborhood folks. That night we headed downtown to The Old Fashioned for dinner. Apparently so did half of Madison and everyone there for homecoming. 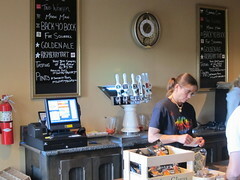 Luckily, we were able to grab a couple of seats at the bar and dive into their list of 150 beers. 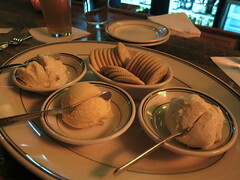 The Old Fashioned patterns itself after traditional supper clubs, but an updated menu. They have amazing sounding Lazy Susans full of cheese, sausages and other treats, but they all sounded too big for us, so we went with the Wisconsin cheese spread tray. 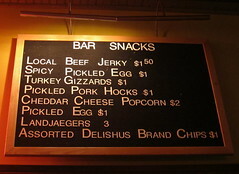 Yes, cheese spread, horseradish, sharp cheddar and garlic, all very good. 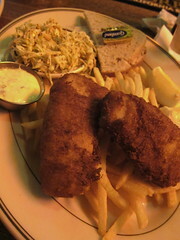 Since it was Friday night it was fish fry night with three different fish on order. I had the cod and Matt had the Walleye. If we lived in Madison I think we'd be among the half crowding it every night. The next morning we went to the Dane County Farmers Market that surrounds the capitol building. A huge market full of cheese, meat, vegetables, flowers and tons of bakeries. It didn't have the prepared food vendors like the Minneapolis markets do, so we walked a block to Marigold, a restaurant recommended to us by a couple of different people. 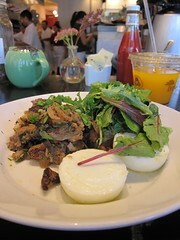 The had a duck confit hash on the menu so how could I refuse. A bright cheerful place with all the breakfast favorites and some interesting "gourmet" choices. 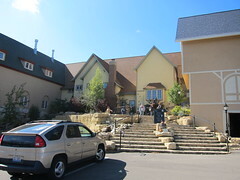 Later that day, we drove the 30 minutes to the small Swiss-style village of New Glarus to visit New Glarus Brewing. 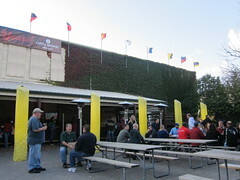 Their large, modern brewery really reminded us of California wineries. 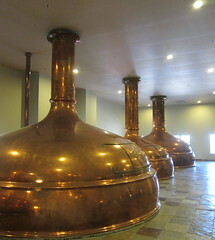 They offer a self-guided tour of the brewery which as nice as the brewery is would benefit from some signage for those of us interested in the brewing process. 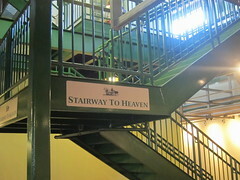 Really it seems like everyone is there for the gift shop, tasting room and beer depot. New Glarus offers three tastings for $3 with a take home tasting glass. You can also purchase a pint glass for $6 with $3 refills or $9 for specialty beer with $8 refills. Since New Glarus beers are only available in Wisconsin we head to pick up s few six-packs at the beer depot to take home. 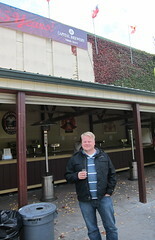 Matt has been a fan of their Moon Man and Fat Squirrel, but on this trip I discovered my love of their Back 40 Bock. 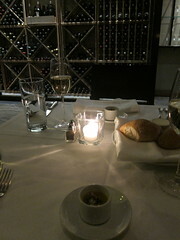 That night being our anniversary, we had made reservations at what many people told us is the best restaurant in Madison, L'Etoile. A modern glass and steel building warmed with blond woods, white furniture and candlelight, L'Etoile is an elegant downtown spot. The menu is French, but definitely French influenced by what is in season locally. The whole back of the menu lists all the local farms where they get their ingredients. We had a beautifully prepared meal paired with wines that suited each course perfectly. On the pricey side, L'Etoile is not a place to eat out often, but for a special occasion it was worth it. 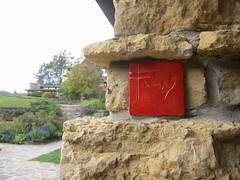 We capped off our weekend with a tour of Frank Lloyd Wright's Taliesin. Truly a perfect midwestern fall weekend. 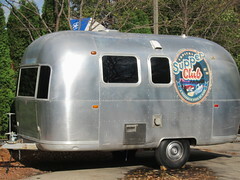 Sounds like a terrific fall weekend - I ::heart:: roadtrips to pretty much anywhere! So glad you had a great visit to WI! We were actually in IL for the weekend. Sounds like you hit all the right spots. New glarus - Yum! And we've been meaning to hit taliesen sounds like a great weekend! Yay for Madison! 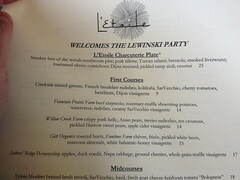 Coincidentally, I also visited my favorite city that weekend and just happened to eat at L'Etoile on Saturday night. What a small world. You guys hit some of my favorite spots. Well done!